Irrigation innovations have made leaps in recent years, focusing on water conservation. Water seemed plentiful 30 years ago, but with the urban areas growing along with our population, the need for water conservation is abundantly apparent. Frequently in the Denver metro area, there are more and more watering restrictions. The Colorado mountain communities have experienced extreme drought conditions and water shortages. Water wells in some communities have slowed in production and a few have dried up altogether. Regardless of the root cause of this, the practicality of water conservation is relevant and we should do our best to use our water resources responsibly. The irrigation design industry is aware of this and has innovated more efficient ways of irrigating our Colorado landscapes. Evergreen Landscape & Design is constantly keeping up with new products that allow us to design water efficient irrigations systems. Taking into account the types of plants and their specific watering requirements, and using subsurface watering techniques and efficient layouts will limit the overall water consumed. Mulching areas receiving water, dialing in computer control systems, and using drip zones in place of spray zones can also effectively conserve water. 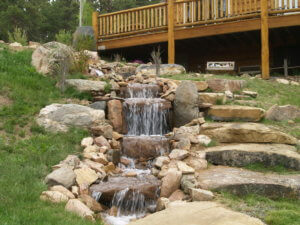 Installation of irrigation systems in Evergreen, Colorado is particularly challenging. It is ideal that the irrigations system, whether in the mountains of Colorado, or in the Denver metro area, be designed and considered when the entire landscape is designed. By making this consideration during a complete landscape design, one can be more strategic as to planting placements and to the areas needing water. It is possible, however, to add irrigation systems to existing landscapes. The most common overuse of water in an irrigation system is just using mass spraying areas. You can see this in a lot of commercial properties where water is just running off the landscape onto the roads, into the drains. It is completely common to see irrigation spray heads spraying asphalt. Our goal at Evergreen Landscape & Design is to design and install irrigation systems that water only what needs watering, and only the amount of water required.